Recently you’ve been sharing your tea leaf predictions with us and now that the leaves have settled we can confirm; changes are coming soon to Pottermore.com. 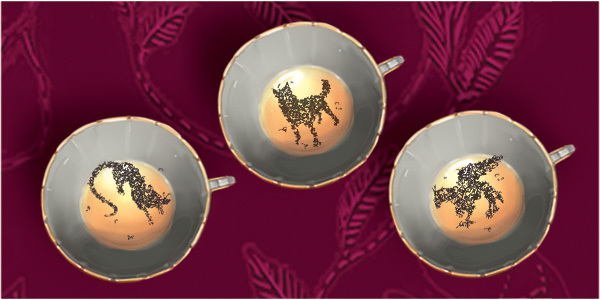 The teacups show the shapes of three different creatures – a Hippogriff, a large dog and a rat. Each creature represents a different Moment from the first chapters of Harry Potter and the Prisoner of Azkaban, coming very soon to Pottermore.com. We’re offering you the opportunity to choose which of these three Moments will be featured in a sneak peek preview on the Insider (you have to vote in the poll, click here to vote). Our poll will close at 23:59PM GMT, Sunday 16th December. On Monday 17th of December, we will unveil the winning Moment as chosen by you, here on the Insider. The message has become clearer…The tea leaves have revealed a Hippogriff, a large dog and a rat. Each creature represents a different Moment from the first chapters of ‘Harry Potter and the Prisoner of Azkaban’, coming soon to Pottermore.com. Vote now for the Moment you want revealed as a Pottermore.com sneak peek, exclusively on the Pottermore Insider. so what you think? well I have read some fans saying that when they say is "coming soon", it means that takes some weeks...I don't think it won't be this time, for a very simple reasons, bare with me, Christmas is practically at the door in 7 or 9 days ahead, and a week after is New Year, usually at this time, there will time be spent with the family because of this events, just as much for the workers and us, users. So for the Monday like it announced in the news, the winner moment in the poll will be revealed in a sneak peek. I suspect it will come out on Friday or after Christmas and before New Year the 1st chapters as gift, I mean the last instalment of Chamber of Secrets was obviously purposely on 31st October , because of the Halloween and is highly celebrated in Hogwarts, so I think because Christmas(Christmas Eve and Christmas is on Monday and Tuesday) and New Year(the same with Christmas, on Monday the Eve and Tuesday 1st day of 2013) is coming, that's why I think the 1st instalment will be released before Christmas, not on weekends because they don't even post on weekends. on a related note of what maybe inside of the 1st instalment, remember when I said I suspected it will be released 7 chapters as 1st instalment? from the 3 images on the leaves inside the 3 cups, Rat, Large Dog and an Hippogriff, well it represents the chapters moments that there will be focus, such as Sirius in his animagus form in Magnolia Crescent in Chapter 3, Scabbers/Wormtail in Magical Menagerie in chapter 4, Hagrid's 1st class in chapter 6 and so is the tea leaves, it may be 6 chapters because then would be 8 chapters in each instalment after but if is 7 chapters would be 7+8 in the future, I'b prefer 7+7+8 than 6+8+8, I really wonder, but I think they will put chapter 7, I mean who doesn't want to see the boggart class moment? I guess we won't have our Hogsmeade yet :/ unless they release 10 chapters...but I don'y think so. this is post about Pottermore was bigger than I thought it would be.